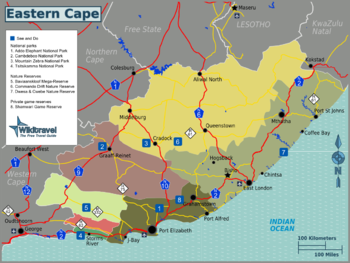 Eastern Cape,  is in South Africa and stretches along the Indian Ocean between Western Cape and KwaZulu-Natal. The Eastern Cape province includes the former "homelands" of Transkei and Ciskei. With a long coastline on the Indian Ocean it offers great beaches as well as several very interesting National Parks. Its population is mainly Xhosa-speaking and the province is home to several of South Africa`s most important persons in the fight against Apartheid (e.g. Nelson Mandela, Thabo Mbeki, Steve Biko and Oliver Tambo). It's still a poor province especially in the former homelands but beautiful and not so touristy. Eastern portion of the Garden Route, the coastal region from St Francis in the east to the Western Cape in the west. The coastal region between East London in the north and St Francis in the south. The inland region bordering onto the Western Cape and rest of the Karoo in the Northern Cape. The inland region bordering onto the Free State and Lesotho. The coastal region between KwaZulu-Natal in the north and East London in the south. Port Elizabeth - the largest city in the province is connected to the rest of the country by flights, motorways and rail. East London - the second largest city is accessible by plane, car and train and is the starting point for traveling to the former Transkei and Wild Coast. Grahamstown - heart of the Settler Country offering traditional atmosphere. Mthatha (formerly called Umtata) - the main city in the former Transkei. Graaff-Reinet - the capital of the Karoo desert and a national heritage site. Cintsa - backpackers haven with two famous hostels and a great atmosphere. Hogsback - high up in the Amathole mountain range, surrounded by indigenous forests with hiking trails and waterfalls. Tsitsikamma National Park (Book through the Parks Board) phone: +27 (0)21 423 8005. Wonderful coastal scenery with great hikes and walks, nice accommodation, between Plettenberg Bay and Humansdorp including the famous Otter Trail. The main motorway in the province is the N2. It runs along the coast from Cape Town via the Garden Route, Port Elizabeth, the Transkei and further through KwaZulu-Natal and Mpumalanga. The road condition is mainly excellent except in the Transkei (Do not travel the Transkei portion of the N2 at night as the potholes can be deep and there are often stray animals ie cows and goats wandering around). Follow the N1 toll road south until Colesberg, then follow the N9 from there towards Graaff-Reinet and George or follow first the N9 and then the N10 towards Port Elizabeth. Avoid driving the N9 and N10 at night as game often wander onto the road at night and accidents are not uncommon. A full grown kudu or other large antelope and cause some severe damage to you and your vehicle. Port Elizabeth and East London are the main national airports both with several flights daily to other South African destinations, but no international flights. Spoornet operates regular trains from Johannesburg to both Port Elizabeth and East London. There is also a once-weekly service from Cape Town to East London, a daily service between Grahamstown and Alicedale and a weekend-only service between East London and Mthatha (via Amabele). Definitely the best option if you are more than two as several regions and some of the National Parks aren't accessible by public transport. Road Conditions are mainly good but get informed before you start. Car rental is available in larger cities and along the popular resorts of the Garden Route. Be careful of wild animals, especially monkeys, on the road. Be especially careful if driving at night. The main companies cross the Eastern Cape on their way from Cape Town to Durban. There are other main routes from Port Elizabeth and East London to Johannesburg. The Baz Bus traverses the province on its Cape Town - Port Elizabeth - Durban run ; Port Elizabeth is a compulsory overnight stop. Minibus services are available for local transport between neighbouring towns (and also on several longer distances). With the limited range of railways this isn't really a viable option for touring the province. However, the route from Grahamstown to Alicedale is very scenic and well worth doing. The newly-opened line from East London to Mthatha also traverses some dramatic scenery through the Wild Coast. Graaff-Reinet: a national heritage site and the classical example of an inland town. Morgan's Bay: Seaside village with magnificent cliffs that plunge into the sea. Kei mouth: Southern gateway to the Wild Coast via one of South Africa's two remain pontoon car ferries. Tsitsikamma National Park: not as spectacular as some of the other National Parks it offers superb coastlines, whale watching and excellent hiking. Addo Elephant National Park: famous for the elephants this park is after the unification with Zuurberg NP one of South Africa`s largest. Also has lion. Mountain Zebra National Park - small, but only very few people there. See the endangered Mountain Zebras. When in Jeffreys Bay or Paradise Beach, try the beach restaurants near Marina Martinque called Tapas - cheap or the Whale Skipper slightly more expensive. Wherever try the calamari. The Garden Route is a major tourist destination with a broad range of accommodation in all ranges as is Port Elizabeth. North of East London is the spectacular Wild Coast which begins near Morgan's Bay and Kei mouth. Accommodation is a little bit more limited inland, but there will always be an option. This page was last edited on 30 April 2018, at 14:08.